The upcoming L.A. stop on the national tour of Star Trek: The Ultimate Voyage, a two-hour concert of Trek music commemorating the franchise’s 50th anniversary, offered an opportunity to examine the long history of Star Trek scores and the many composers who contributed along the way, from Alexander Courage to Jerry Goldsmith. 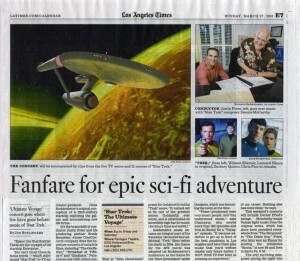 Comments by veteran composers Gerald Fried, Dennis McCarthy and Jay Chattaway, along with concert conductor Justin Freer and even William Shatner himself, are included in this Sunday Los Angeles Times piece. This entry was posted in Composers, Film Music, Interviews, Television Music and tagged Alexander Courage, Dennis McCarthy, Gerald Fried, Jay Chattaway, Jerry Goldsmith, Los Angeles Times, Star Trek, Star Trek IV: The Voyage Home, Star Trek: Deep Space Nine, Star Trek: Enterprise, Star Trek: The Motion Picture, Star Trek: The Next Generation, Star Trek: The Ultimate Voyage, Star Trek: Voyager, William Shatner on March 26, 2016 by Jon Burlingame.